Every year, several large and small farmers in major agricultural states of India burn the crop residues after harvesting. However, it is possible to transform this waste into a valuable resource by making use of modern energy conversion technologies. The rural population of India exhibit unique resource optimization capabilities as compared to urban populations. Tracts of land are cultivated and cattle are reared and the produce is sold off in the market or consumed. The wastes generated from crop cultivation and rearing animals are also utilised domestically. While the dung of animals is converted to dung cakes and used as fuel in inefficient cooking stoves (chulhas) and domestic heating in winters, the crop residues are usually burnt off so as to reduce the costs involved in storage, handling etc These activities are wasteful, uneconomical and bear a huge impact on the health of people who come in direct contact. It also leads to air pollution problem. The opportunity cost of this resource is not met by such a wasteful activity. However, it is possible to transform this waste into a valuable resource by making use of modern energy conversion technologies. The coming paragraphs analyse the costs, benefits and constraints associated with anaerobic digestion, a green technology for conversion of organic wastes into biogas and nutrient rich compost. Every year, several large and small farmers in major agricultural states of India burn the crop residues after harvesting. During April and May, wheat crop stubble is burned after harvesting whereas rice crop stubble burning is performed during October and November. The residue to crop ratio (kg per ton of waste) for wheat and rice are 1.47 and 1.86 respectively. (Pallav Purohit, 2006). This crop residue burning leads to the release of several atmospheric pollutants such as aerosols, suspended particulates, SOx and NOx and in some cases dioxins and furans. Further, burning of the standing crop also leads to volatilization of the soil nutrients, decreasing soil fertility. Dung cakes are extremely popular for cooking purposes in rural India. Burning of dung cakes leads to toxic emissions in the form of SPMs, PAHs and CO. Studies relate cow dung cake burning with cases of tuberculosis, lung cancer etc. (J. B Kandpal, 1995). Thus, the external costs (environmental damage, soil damage, health damage) associated with the traditional methods are enormous. In Indian context, the Deenbandhu model is the most economical anaerobic digester. It was developed by Action for Food Production (AFPRO), New Delhi, India, in 1984 (Sooch, 2004). This model is designed on the basis of the principal of minimization of the surface area of a biogas plant to reduce its installation cost without sacrificing the functional efficiency. The design consists of two concrete spheres of different diameters, joined at their bases. The structure thus formed acts as the digester or fermentation chamber, as well as the gas storage chamber. The digester is connected with the inlet pipe (coming from slurry mixing tank) and outlet tank (for collection of digested slurry). The selection of the size of biogas plant to be installed depends upon the number of persons to be served or availability of feedstock. About 25kg of dung is required per 1m 3 of biogas production (Sooch, 2004). The resultant bio fuel i.e. biogas has high calorific value and produces little pollutants on burning. 1) The initial costs of construction and installation of the technology: The structure of a digester is divided into three components – the slurry mixing tank, the digester and the digested slurry collection tank. In the Deenbandhu model, these structures are all masonry structures. 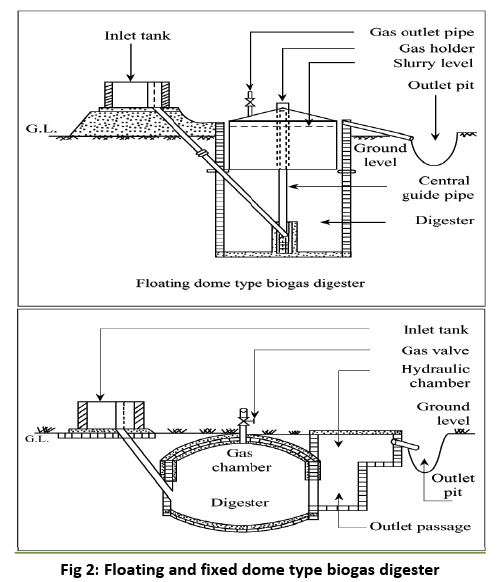 Moreover, the digester is an underground, dome-shaped structure. 2) Costs involved in functioning: This involves costs associated with mixing of feedstock in the slurry tank with water, collecting the digested slurry from outlet tank, drying the digested slurry (by solar-drying or mechanical dryers). 3) Costs incurred in maintaining the digester in a functional state: The plant requires constant supply of feedstock and cattle dung for generation of biogas. Depending upon the size of the plant, the feedstock required varies. After construction, costs are involved in running the plant efficiently. The construction material and other installations have a fixed lifetime. The life of Deenbandhu anaerobic digester is around 20 years. (Sooch, 2004). 4) Costs associated with technology upgradation: Crop residues should be shredded before being co-digested with animal manure. The efficiency of the plant increases if the shredded residues are made into a partially homogenous slurry using hot water. These processes may involve more financial inputs. 5) Costs of transportation: Transportation costs will involve those associated with transport of the feedstock to the plant, if it is a large-scale community level digester. It will also include the transportation cost to the market for selling the compost produced from the dried slurry. Anaerobic digestion proves to be a beneficial technology in various spheres. Biogas produced is a green replacement of unprocessed fuels (like fuel wood, dung cakes, crop residues). It is a cost effective replacement for dung cakes and LPG (wherever used). A study conducted in rural households in Patiala, present in the state of Punjab in India, reveals that 1 m 3 of biogas equals 0.43 kg of LPG. The yearly income from a 1m 3 biogas plant, thus, amounts for Rs. 1821 (Sooch, 2004), which is a considerable amount for low income level farmers. An additional benefit is that the quantity of digested slurry is the same as that of the feedstock fed in a biogas plant. This slurry can be dried and sold as high quality compost. The nitrogen-rich compost indirectly reduces the costs associated with use of fertilizers. It enriches the soil, improves its porosity, buffering capacity and ion exchange capacity and prevents nutrient depletion thus improving the crop quality. This means increased income for the farmer. Further, being relatively-clean polluting cooking fuel; biogas reduces the health risks associated with conventional chulhas. Thinking regionally, decreased residue burning brings down the seasonal high pollutant levels in air, ensuring a better environmental quality. Anaerobic digestion thus proves to be more efficient in utilization of crop residues. The social benefits associated with biomethanation, along with its capacity to generate income for the rural households make it a viable alternative for conventional methods. The farmers are largely unaware of the possible ways in which farm and cattle wastes could be efficiently utilised. The government agencies and NGOs are major stakeholders in creating awareness in this respect. Moreover, many farmers find it difficult to bear the construction and operational costs of setting up the digester. This again requires the government to introduce incentives (like soft loans) and subsidies to enhance the approachability of the technology and thus increase its market diffusion. Traditional methods of farm waste management are unscientific and have several negative externalities associated with them. Being the emitter of stock pollutants, like CO, SOx, NOx, PAHs, and aerosols, which accumulates in the atmosphere, traditional practices have a regional impact apart from local damage. Crop burning decrease the fertility of soil. To meet increasing market demand for more produce, farmers add more chemical fertilizers. With continued excessive usage of chemicals causes’ salinity, further degrading the soil. Burning of dung cakes/ crop residues for cooking and domestic heating causes health ailments like pulmonary diseases (lung cancer, tuberculosis) due to passive intake by people of the house, especially women and children. The adoption of anaerobic digestion is required for better utilization of renewable energy resources. However, certain factors limit its widespread application in rural societies in India. The most prominent being the lack of awareness among farmers and lackadaisical attitude of the government. The federal and stage governments needs to be more proactive in providing easy access to these technologies to the poor farmers. The policies and support of the government are decisive in persuading the farmers to adopt such technologies and to make a transition from wasteful traditional approaches to efficient resource utilization. J. B Kandpal, R. M. (1995). Indore air pollution from combustion of wood and dung cakes and their processed fuels in domestic cookstoves. Energy conversion and management , 1073-1079. Pallav Purohit, A. K. (2006). Energetics for coal substitution by briquettes of agricultural residue. Energy , 1321-1331. Sooch, K. J. (2004). Comparative study of economics of different models of family size biogas plants for the state of Punjab, India. Energy Conversion and Management , 1329-1341.